KAWASOTI, March 7: President Bidya Devi Bhandari has expressed the confidence that the local Shashwatdham would promote cultural and religious tourism. Inaugurating the Shashwatdham developed by the Chaudhary Group at Dumkauli of Nawalparasi district today, the Head of State stressed on the need of paying attention to social transformation by maintaining national unity along with love, compassion and goodwill. The President stated that there is a long history of the development of knowledge on ayurveda and yoga, adding cultural diversity was the asset of the human race. Founder of the Art of Living Shri Shri Ravi Shankar said all the religions had the same goal – wellbeing of all living beings and the Universe, exhorting all to visit the Shashwatdham to see and experience a truthful living. Minister for Land Reform and Management Bikram Pandey declared that the establishment of the Shashwatdham has enhanced the glory of the place. Chairman of the Rastriya Prajatantra Party (RPP) Kamal Thapa said the sanatana religion is an important epitome of yoga and sacrament. 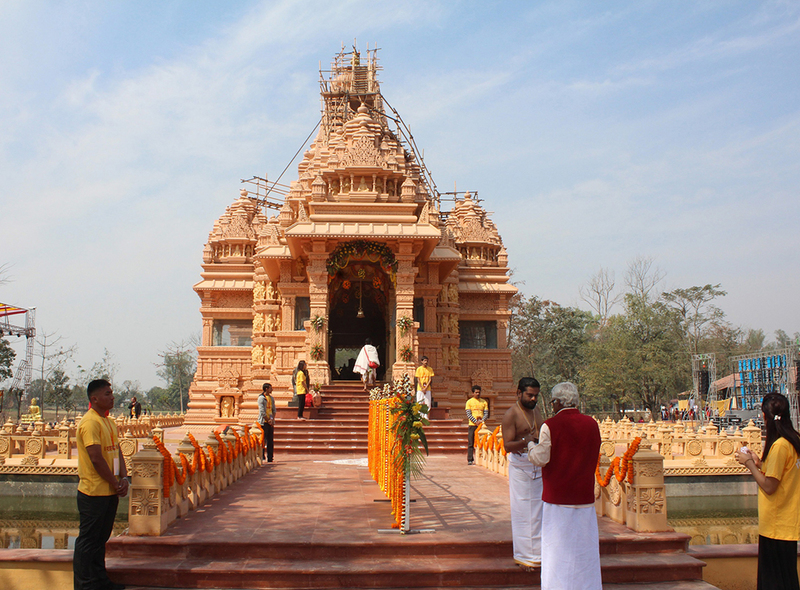 He added that the Shashwatdham is a centre for the study of principles and values of the sanatana religion. Thapa also stressed that it was the duty of all the Nepalis to protect the Nepali culture. Sri Lankan Minister and leader of the United National Party, Daya Gamawe said the Art of Living taught the right way of living a blissful life. Chairman of the Chaudhary Group, Binod Chaudhary said that the Shashwatdham will play a significant role in protecting the sanatana religion and managing the temple priests in temples throughout the country. On the occasion, DR Mehta of Jaipur Foods signed on a letter of commitment to provide assistance for the manufacturing artificial limbs. Also today the pranpratishtha rituals have been performed at Shashwatdham. 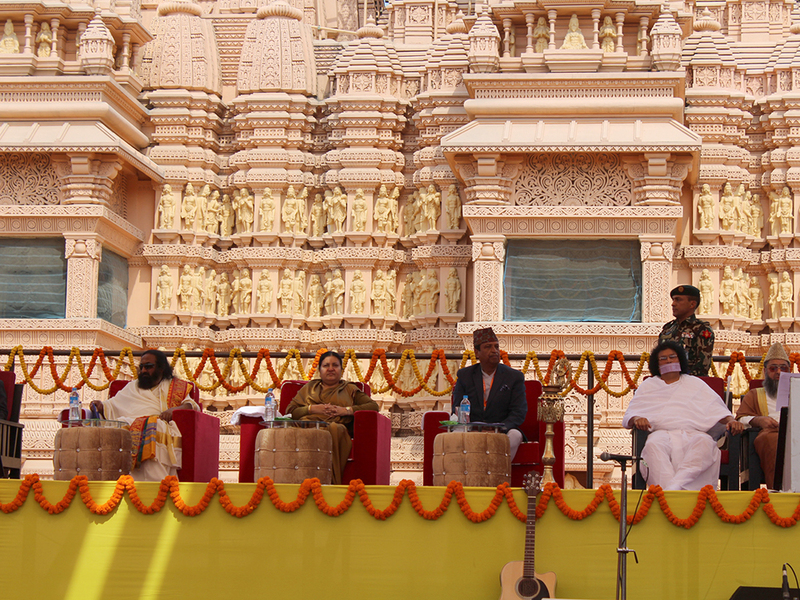 Hindu, Buddhist, Shikh and Jain religious scholars also participated in the event. Shashwat Dham is a center of excellence for spiritual learning. Spread over verdant 12 acres land amidst scenic backdrops of Devchuli and Barchuli hills of Nawalparasi district in central Nepal, Shashwat Dham houses Ekambareshwor—The Shiva Temple—built with the world famous Khajuraho-style of architecture. The temple is surrounded by a pond where holy waters from famous shrines such as Badri, Kedar, Haridwar, Muktinath, and Pashupatinath are poured. Apart from the Temple, the Dham has a Vaidik Karmakanda Gurukul, Sri Sri Center for Meditation and Yogic Sciences, heritage store, organic pure vegetarian restaurant, manuscript resource center, museum, spiritual souvenir store, and organic farm among others. There is a well-equipped audio visual center where visitors can view the latest activities in famous shrines of Nepal and India such as Pashupatinath, Muktinath, Swargadwari, Gosaikunda, Badri, Kedar, Haridwar and others. Similarly, there is a religious information center from where visitors will get information on the different site of religious interest.